The Speed and Strength Double Take Women's Jacket is a new, cool weather, and cool looking women's riding jacket being released this fall. 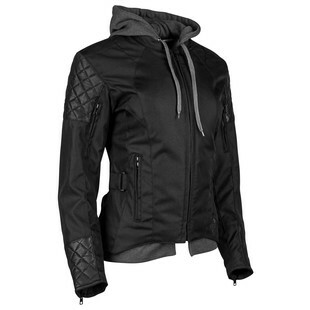 This fully armored jacket has a water-resistant shell, a removable hoody liner and air intake vents on the biceps. So it should work great for folks in temperate climates or during the spring and fall. Since the jacket is only water resistant, this isn't for the rider who heads out in to the eye of the storm for a cross country ride, but it will keep out the cold and should keep you dry long enough to get to your local destination. Leather panels at the shoulders and wrists add some protection and are a good looking style touch. Overall, this new women's jacket is a great choice if you are looking to extend your riding season a bit deeper in to the cooler times of the year.